While the wedding season may be far away, it’s always a good idea to pre-plan your outfits before the madness sets in. When you’ve decided your outfits, getting the right material can be quite a task. We found a few stores that have some really nice fabrics that’ll help you create your dream outfits. H.P. Singh will be likely to meet any and all of your fabric demands. Cottons, embroidered fabrics, knits, linens – they have them all under one roof. Located in Nehru Place, they’re literally a one-stop shop for any kind of fabric that you’re on the prowl for. Based out of Malviya Nagar, they have a steady supply of brocades, cottons, embroidered fabrics, jacquard, net, silks – basically everything that the either the most blingy or the most simple bride would require. You can simply check out their stuff on Instagram and shoot them a text on Whatsapp – they deliver all over NCR! K.C. Creations has been around since the ’60s, and seriously knows its stuff when it comes to weddings. They stock all the latest prints of 2018, as well as the classics. Their endless variety can literally help you replicate any design off of Instagram in a jiffy. Florals, linens, embroidered fabric -, they’ve got the works. If you’re looking to help your date find something, they keep lots of menswear fabrics too. 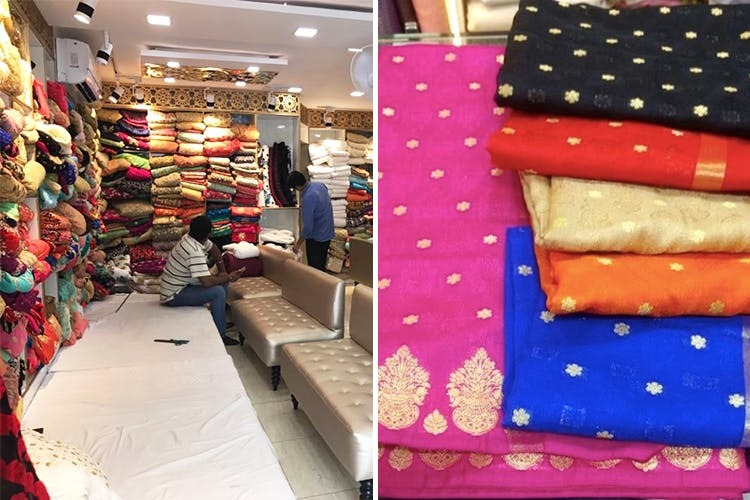 Located in Pitampura, these guys keep all kinds of fabrics – printed linens, imported embroidered rayon and chiffon, embroidered nets, cotton, silk, imported Dutch satin, organza and more. They also keep uploading the latest additions to their collection on their Facebook page, so you can get an idea of what they have at the moment. They are into the retail and wholesale of designer fabrics. We hear they even ship worldwide. We absolutely love how they lay special importance on colours and embroidery. You can get all kinds of fabrics and dupattas here.